So naturally, I would make a Mexican version of this! The great thing about this “bowl” is that it’s loaded with veggies, PLUS, you have the option to make it a bit more raw or cooked - depending on what you’re feeling. And then, hey, I couldn’t help but join in on the fun where we make ‘rice’ but it’s secretly cauliflower. Shhhh…. I think this ups the awesomeness in this Mexican dish since cauliflower actually does work pretty well as a rice-sub, and like I mentioned above, gives you an extra punch of veggie goodness. Can’t argue with that! So if you like eating Mexican & don’t mind your veggies, then you need to make this tonight! One bowl, two variations with a ton of vegetables packed in as we playfully disguise cauliflower as rice. In a small pot over medium heat, add all ingredients except cilantro, cover and let cook until onions are tender. Remove and add in cilantro. Food processor: Cut cauliflower head in quarters, remove stems and then further cut into chunks. Place in food processor and pulse until it resembles rice. Food grater: Cut cauliflower into chunks and then run on a food grater. COOKED CAULI: Over medium-high heat, sauté in frying pan until pan heats up, then put lid on let cook for 5-8 minutes. 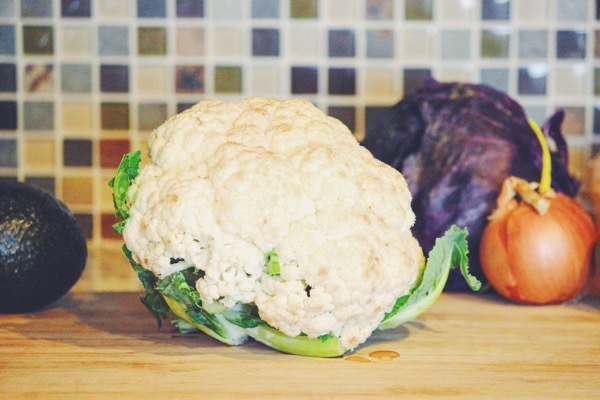 RAW CAULI: Place cauliflower in a large bowl, squeeze some lime juice on it, salt & chopped cilantro. Start with cauli-rice on the bottom, next add on beans + additional veggies of choice (peppers, pico de gallo/tomatoes, red cabbage, avocado), then top with some more chopped cilantro and hot sauce. Enjoy!